Check in at your airport, where our local representative will be on hand to assist you. On arrival, you will be met by our guides who will direct you towards your luxury coach ready to start our transfer to this most Blessed village, Medjugorje. The guide on the transfer will inform us of what we can expect during our time here as we view the splendid scenery on route. 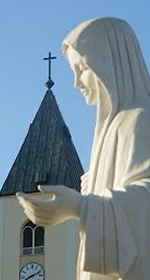 As we drive into Medjugorje, with the steeple of St. James Church first greeting us, we will arrive at our house. With all rooms allotted on the bus, we are firstly introduced to our host family and we can then rest in our rooms before being called for a light snack, or dinner, which will be served depending on the time of arrival. Each evening, we will attend the parish evening programme. It begins with the rosary followed by Holy Mass and depending on the day, we finish with adoration. We start our day with breakfast before attending 10:00am mass, which is intended for English-speaking pilgrims, in the Church of St. James. The Church of St. James is placed under patronage of St. James the Apostle, who is patron saint of pilgrims. We do not move very far and usually meet at the shrine of Our Lady of Peace for our opening meeting where the guides take us through the week, and through their words and experiences enlighten us to the messages and intentions of Our Lady. We remain on the grounds of St. James and walk to the Statue of the Risen Lord for a prayer service. This is a quiet, revered spot where many pilgrims find solace while marvelling at the statue and Apparition Hill in the distance. We break for lunch where restaurants are in abundance and boast some of the best steaks and pizza. The afternoon takes us to Blue Cross, a shrine of Our Lady situated at the base of Apparition Hill. Many pilgrims venture here to bask in the peace that emanates from this area. From Blue Cross, we walk to Vickas old house. Vicka is one of the visionaries and we visit her house where she speaks to us about Our Ladys intentions and messages. After dinner, we can attend the evening programme. This morning after breakfast, we gather at the statue of Our Lady to walk through the vineyards, to the Hill of Apparitions (Podbrdo). This has been the tradtional route taken by millions of pilgrims. The guides regale us with accounts of the first days of the apparitions and tell us of the great spiritual journey the visionaries undertook. We simply climb, in prayer, to the site of the first apparition. We pray the Joyful mysteries as make our way to the Statue of Our Lady. This afternoon there is an optional tour to Cenacolo, which is a community for recovering drug addicts. There is a lesson to be learned from the residents here, by their hard work, perseverance and prayer. After dinner, we attend the evening programme. Today we have the opportunity to meet with one of the visionaries for a talk on the messages. Our Lady of Peace leaves us messages each month through the visionary, Mirjana. Through these messages we are called upon to pray the Most Holy Rosary. Our Lady maintains that we will receive many graces by praying the Rosary. In the afternoon, we visit the Church of the Divine Mercy in Surmanci. This is a very popular place with pilgrims as a miraculous healing took place here before the icon of the Divine Mercy. Our day begins with breakfast and we then meet at the base of Cross Mountain (Krizevac) to start our ascent. We pray the Stations of the Cross as we make our way to the summit. 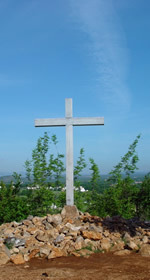 Our journey is rewarded by taking time for reflection and prayer by the cross located at the top of the mountain. In 1933, the parish of St. James erected a large concrete cross to commemorate the 1900th Anniversary of Jesus� passion and death on the Cross. We make our descent in time for dinner. This evening we have a treat as our programme director, David Parkes, performs for us in concert with an Evening of prayer through song. David is an internationally acclaimed singer and often travels worldwide singing the word of Our Lord. Today we gather to hear from one of the priests. 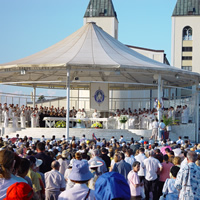 With Medjugorje as their base, they can shed light on issues we may be struggling with such as confession or sacrifice. In the afternoon we will visit a neighbouring Franciscan monastery and the Shrine of St. Anthony. After dinner you may take part in the evening ceremonies where the mysteries of light in the Via Domini will take place afterwards. We then visit the grave of Fr. Slavko, the parish priest of Medjugorje at the time of the apparitions. He travelled the world spreading the message of peace and reconciliation of Our Lady. We meet as a group to join in the closing meeting on the church grounds. David and the guides conclude the week with prayer and a short follow up on the week. We finish the programme with a visit to the Mothers village. This is an orphanage founded by the late Fr. Slavko for children whose parents had died during the war. 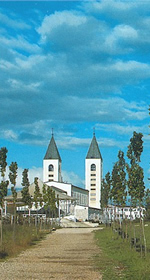 This village is a visible fruit of Medjugorje. After dinner, we can participate in the evening programme. Our guide will collect us at our house for our transfer to the airport for our return flight. COPYRIGHT © 2018 MARIAN PILGRIMAGES. ALL RIGHTS RESERVED. All images, text, and content within this web site are subject to copyright laws. Reproduction in whole or in part in any form or medium is prohibited. that everything you booked (flights, hotels and other services) is listed on it. Marian Pilgrimages will not be held responsible for any omissions or mistakes in text or graphics.